The truck is hidden a half mile away, the decoys are set and a brisk east wind is at my back. Legal light is still 10 minutes away and life is good. Yesterday morning I head the murmur of geese from my deer stand a good hour after sunrise so plenty of time to sip some coffee, stretch out and enjoy the solitude. The good thing about Canada Geese is they usually announce their arrival with a honk or two. So I figured a little shut eye wouldn’t hurt. I’d been up early deer hunting for a week and the old body was starting to feel it. 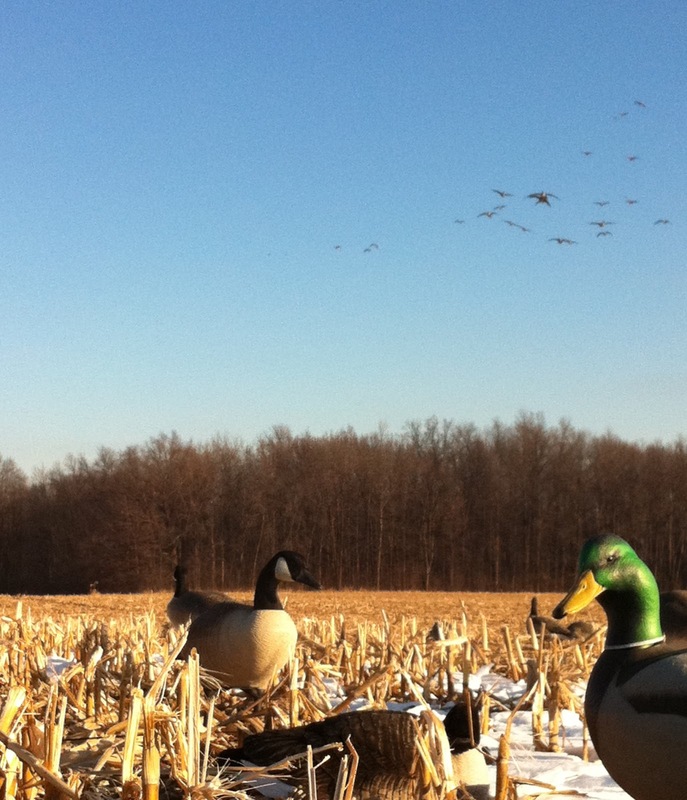 By the time my brain registered the sound of wings and my eyes focused, the ducks were landing in the corn stubble on the far side of my decoys. 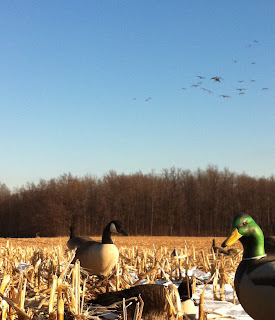 With a slight tilt of my head from the layout blind I could see three beautiful greenheads. I love to eat mallard and hadn’t had any time to hunt them this fall. My stomach said go for it. But a little voice in my head said not so fast buddy. Whatever I decide, I know it’s legal and it’s safe – OK so far. Can I make a clean kill? I’ve got double Bs in the gun, full and modified chokes. I’m guessing they are out 35 yards. I’ve killed plenty of geese at this range, but ducks are smaller and even cripples are hard to swat on the ground with #4s. Flush them? They would be at least 5 yards further away before I could shoot and that is the edge of my ability and range for a clean kill. They are moving further away - it’s decision time. As hunters we face tough ambiguous decisions all the time. Most of the time we are going to be the only ones who know what we do - no witnesses and no referees. Every thing you have experienced, read, talked about and thought about coalesces into a little voice that whispers the answer. For me it was a clear – don’t shoot. As they walked away, I rethought my decision and came up with two bottom line reasons not to shoot; 1) marginal odds for a clean kill, 2) poor fit with why I hunt. 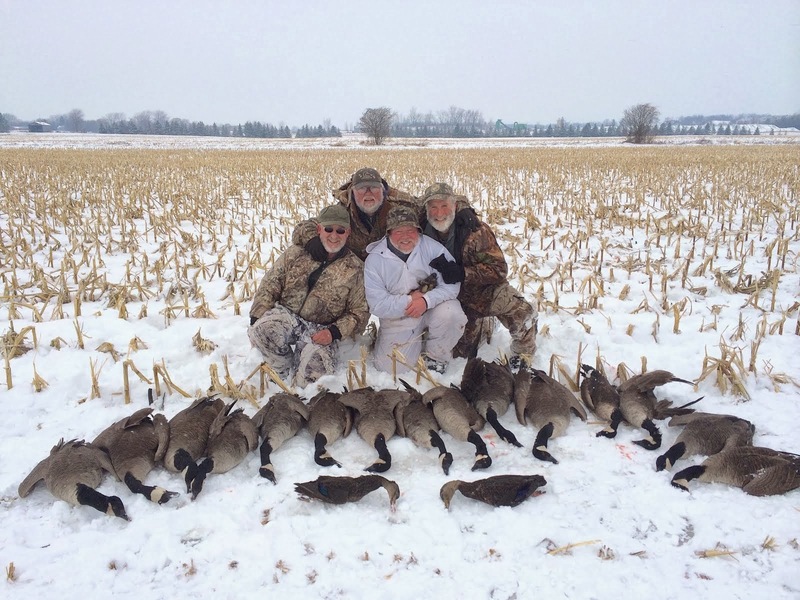 I hunt waterfowl as a way to immerse myself in the wild, for the enjoyment and satisfaction of bringing them in close and hopefully making a skillful wing-shot. The eating is important but only a tasty bonus. An hour later the goose Gods smile on me when 23 beautiful Canadas worked my decoys and on the third pass came right in. Two shots and two geese were dead in the air. Preparedness and skill, met with opportunity and challenge. Made all the sweeter by doing it right. As hunters, our relationship with the animals we pursue in fair chase is experimental. In looking across human history it is hard to find anything like the association between hunters and the hunted that has developed in North America. In most places, and through most of recent human history, wildlife belonged to those of privilege or property. Hunting was, and in most places on earth today remains, the sport of kings. The American Revolution separated us from the king and produced a system of free people governing themselves. Fish and wildlife were not mentioned in any of our founding documents. The void was filled by court decisions that established water, fish and wildlife as public resources held in trust by the states for the benefit of all the people. Their words at the time were “When the revolution took place, the people … became themselves sovereign…” In short, since you and I are sovereign, the king’s deer became the people’s game. America would have a democracy of the wild. When that initial court decision was issued in 1842 Montana had a wildlife resource that “… for variety and abundance exceeded anything the eye of man had ever looked upon.” Forty-one years later a young Theodore Roosevelt (TR) came west to hunt buffalo. He borrowed a gun, hired a guide and hunted for nine days through the rotting carcasses of the last commercial slaughter before finding and shooting a lone, wandering bull. He found that lone buffalo on Little Cannon Ball Creek, Montana Territory. Two years later TR would write of a ranchman who made a journey of 1,000 miles across Northern Montana and was, “… never out of sight of a dead buffalo and never in sight of a live one.” Montana was the wildlife bone-yard of a continent. These experiences contributed to a conservation epiphany among a handful of visionary hunters. In 1887 they formed a citizen based hunting club to introduce the fair chase sporting code and restore big game to America. Four years later they lobbied a provision through Congress allowing presidents to set aside unclaimed lands for conservation purposes. When TR became president he used that authority to set aside almost ten percent of America for wildlife restoration along with public forest conservation. A generation later, when an economic depression and the dust bowl had our country on its knees, hunters championed an excise tax on firearms and ammunition to fund the struggling wildlife restoration. Today we take to the field in pursuit of a wonderfully restored wild abundance in a relationship with nature perhaps unique in human history. When we take rifle in hand and head for the outdoors it is essential that we also carry the conservation ethic that put both you and the game pursued in the field. We as hunters need to embrace the truth that we and the antelope, deer, elk, goose and duck we pursue, sprouted from the same diamond buried in our American heritage. Once we accept and remember that exceptional reality, the decisions made afield will be easy. We will: respect the animals; honor the relationship we share with them; afford them fair chase; and measure up to the conservation ethic generations of hunters passed to our custody. As conservationists, we take it for granted that diversity is good. Biological diversity, at least. A group of researchers is calling for “extreme care” in managing trophy hunting after finding that the harvest of males that hunters worldwide choose could contribute to extinction in some species if not properly managed. By targeting animals with large horns and other prized features, researchers found, trophy hunting can “lead to extinction” by removing the fittest genes in populations trying to adapt to increasing environmental pressures. When it comes to monitoring elusive wildlife, the simple approach is sometimes best. Researchers in New Hampshire have found that hunter surveys are a reliable tool for studying bobcats (Lynx rufus), yielding solid data even when high-tech approaches fail. In March, the U.S. Fish and Wildlife Service (USFWS) announced its intent to remove protections afforded by the U.S. Endangered Species Act (ESA) to grizzly bears in the Greater Yellowstone Ecosystem (GYE). However, conservation organizations oppose “delisting” GYE grizzlies. They citepersistent threats to grizzlies, public opposition to delisting and ongoing scientific uncertainty regarding the population’s viability. Indeed, scientific uncertainty, especially threats posed by a changing climate, is one reason a federal courtreversed a similar decision back in 2009, returning federal protections to GYE grizzlies. ...A second source of underappreciated insights is from the academic discipline of conservation ethics. A broadly applicable insight from that discipline is that robust conservation decisions result from sound and valid arguments that are necessarily comprised both of scientific premises and ethical premises. The implication is that in many instances the best an expert can do is explain their judgment fully. That is, to lay bare all of the premises (scientific and otherwise) necessary to arrive at the judgment being proffered; and in so doing, demonstrate the robustness of the judgment (or reveal its flaws). So an expert judgment is not merely a judgment made within the area of one’s expertise. Rather, an expert judgment is one whose underlying argument can be laid bare and demonstrated to be sound and valid for an audience of nonexperts. Importantly, this includes both scientific assessments as well as value judgments. Sadly, courses that convey skills in analyzing ethical arguments (i.e., courses in critical thinking and environmental ethics) are not typically part of the curricula that produce conservation professionals. and the species that reside in them. uses, to say nothing of the local cultural and economic significance of the annual hunt. competition for food due to the shrinking habitat that has resulted from global warming. breakfast comes from the grocery” (1968, p. 6). stalled conservation efforts (i.e., land developers and corporate polluters). social and environmental issues by picking an easy scapegoat issue. When I walk down to the beaver pond near home and look out at the water and surrounding land, I know that each plant, fungus, insect, amphibian, reptile, fish, bird, and mammal—even each unseen microbe in the soil—is part of that community, part of a larger, dynamic, evolving organism. As such, each deserves my respect: pine and alder, mayfly and jewelwing, salamander and turtle, minnow and trout, heron and mallard, mouse and coyote. A snapping turtle lays its eggs near the Leopold Center. Concerning ideological and cultural diversity, we are ambivalent at best. Beavers may be providing watersheds a service by removing some of the agricultural nitrogen runoff in northeast rivers. “There’s a huge concern about the amount of nutrients of our lands that get into coastal waters,” said Arthur Gold, a professor and chair of the Department of Natural Resources Science at the University of Rhode Island and coauthor of a study published recently in theJournal of Environmental Quality. Poaching of black rhinoceros (Diceros bicornis) in South Africa increased by 21% from 2013 to 2014. On 2 November the U.S. House of Representatives passed H.R. 2494, the “Global Anti-Poaching Act”. The bill passed by voice vote after 23 minutes of speeches in favor of the act. The legislation seeks action against wildlife trafficking through three main avenues: strengthening and expanding wildlife enforcement networks; punishing countries failing to make efforts to combat wildlife trafficking; and increasing the penalties of wildlife trafficking. This Week on "Randy Newberg Unfiltered"
BOZEMAN, Mont. 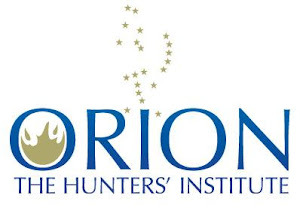 – On the latest episode of "Randy Newberg Unfiltered"radio show, host Randy Newberg chats with Jim Pozewitz, long time friend, conservationist and founder of Orion – the Hunter's Institute. 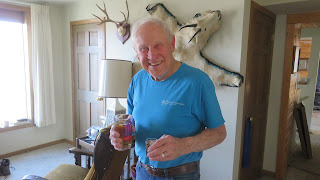 "We referred to this podcast as the Poz-cast since Jim and I go way back and talk, unfiltered, on hunter responsibilities and how conservation is led by hunters and their success," said Newberg. "Jim is a leader in the conservation field as many of his books and papers on conservation are still used today by state wildlife agencies, schools and more." Newberg talks with Pozewitz on the "Dirty Thirties," which is the start of the conservation movement with key leader, President Theodore Roosevelt. The duo dissects Roosevelt's legacy, beginning with his start in forming a relationship with government and society to better land and wildlife. If you had less than a minute to tell a stranger what drives your love of hunting, fishing and wild places, what would you say? Here is what a small group of us in the Eastern Chapter of the Backcountry Hunter's and Angler's came up with. We unite avid outdoors people who enjoy getting off the trail, and who hunt and fish following strong conservation ethics. Grounded in the views of Aldo Leopold and Theodore Roosevelt, we value the full range of wild flora and fauna, from apex predators to invertebrates. We believe that what we do as hunters and anglers must put the good of the environment first. We are vocal about conservation policy, speaking up for wildlife and wild places. We look for common ground where hunters, anglers, and environmentalists can work together. Whether we hunt and fish in the West, the East, or both, we value the “backcountry ideal”—the quiet and solitude of wild places near and far, large and small. We see ourselves as full participants in the natural world and enjoy being immersed in it. Firmly embracing ethical hunting and fishing practices, we honor the animals and fish we pursue. We voluntarily limit our use of off-road vehicles and other gadgets, and also limit our take. From wild places across the nation to Washington, DC, we are boots-on-the-ground people. We make a difference by caring and by being involved. The new hunter ethics campaign being launched by one group of Montana volunteers is simply the latest step in what will likely be a long process to educate hunters and nonhunters alike. Last week the Citizen Advisory Committee for Montana Fish, Wildlife and Parks’ region 3 announced the official plan for its Hunt Right campaign. The goal is to promote ethical hunting and educate nonhunters to the fact that the vast majority of sportsmen and women keep ethics at the forefront of their mind while out in the field. Note: Orion board member Thomas Baumeister is involved with this effort with other Orion member input. To find out more information about the Hunt Right campaign, look at their Facebook page at www.facebook.com/huntrightmt or go to a website set up for them by the Montana’s Outdoor Legacy Foundation at huntrightmt.org. WASHINGTON - A highly anticipated rule that would enhance critical fish and wildlife habitat, improve the nation's supply of drinking water and restore clarity to the federal Clean Water Act was finalized this morning, eliciting praise from business owners and sportsmen's groups, including Backcountry Hunters & Anglers. Today's announcement by the administration concludes a multi-stakeholder process aimed at eliminating confusion surrounding the scope of the Clean Water Act. The resulting "Waters of the U.S." rule reflects a lengthy and comprehensive vetting process, including more than 1 million public comments. Widely supported by citizens, sportsmen and outdoor-focused businesses, it represents a practical approach that addresses the needs of both industry and the general populace. "The release by the administration of the final Waters of the U.S. rule culminates an unprecedented effort to restore clarity to a bedrock natural resources law, the federal Clean Water Act," said BHA Executive Director Land Tawney. "The rule will conserve resources important to our fish, our wildlife, our citizens - and to the waters and wetlands that are central to our national identity. "A chorus of ducks can be heard quacking from the wetlands where waterfowl are busy nesting and rearing their young, and fishtail slap high-fives are surfacing on the headwaters of our nation's most precious trout and salmon streams," continued Tawney, an avid waterfowler and angler. "These are some of the key habitats protected via the Waters of the U.S. rule. We thank the administration for persevering in the face of unrelenting opposition to sustain these places - and the outdoor opportunities they provide - for future generations to experience and enjoy."